Easily sketch design details & placements based on real dimensions. Fill sketches with color & fabrics FAST without joining paths – Live Paint friendly! Welcome to fashion technical drawing made easy! Mix & Match Adobe Illustrator flat fashion sketch templates developed specifically to reduce flat sketching time for designers! So you need to draw Illustrator flat sketches for your fashion design portfolio, line sheets, tech packs, or CAD presentation boards, but the fashion industry is so fast-paced that designers rarely have enough time for drawing basic flat sketches, let alone sketch more interesting design elements like style lines and novelty details. Yup, we’ve been there – so what’s a designer to do? We’ve pre-drawn tons of fashion flat sketches in Adobe Illustrator, so that YOU won’t have to! Our mix & match Illustrator Fashion Sketch Templates have everything apparel designers need for quick flat drawing of just about any fashion design idea you can think of! All Adobe Illustrator flat sketch templates are drawn with careful placement of anchor points, grouped objects, and guidelines at CF & CB, so they are easy to use, adjust, and fully customize to sketch different apparel designs. 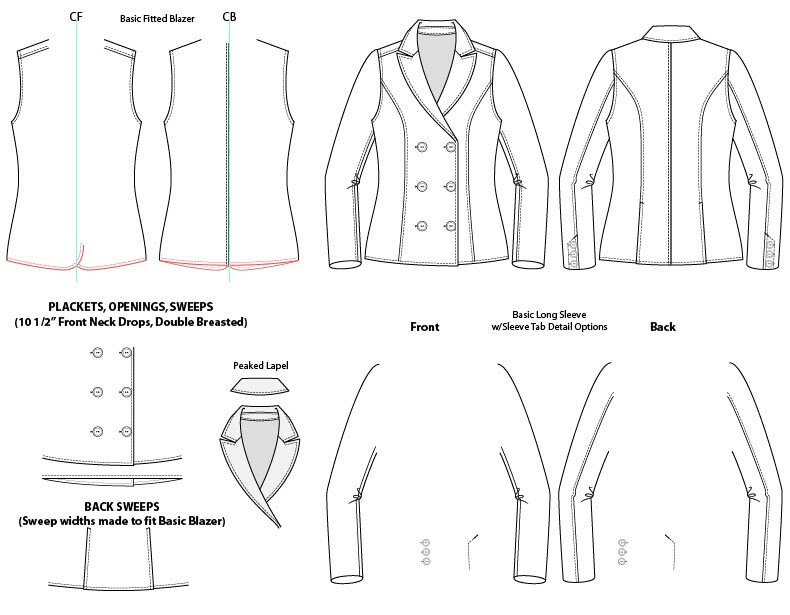 Each flat drawing template is sketched to fit with one another, so you can simply mix and match silhouettes and garment details to quickly sketch fashion flat drawings. Kind of like paper dolls for fashion technical drawing: just grab the body silhouette you want and pair it with mix & match collars, sleeves, pockets, waistbands, and other apparel details to draw technical flats in no time! And with over 1,300 fashion flat sketch templates to choose from, the design combinations are endless! Our to-scale Adobe Illustrator fashion flat drawing templates are sketched in a style that is both professional & aesthetically pleasing, so your fashion portfolio, presentation boards, and tech packs will look clean and professional. Sure to impress prospective employers & clients, leaving them guessing how you did it so fast! Adobe Illustrator Fashion Sketch Templates contains mix & match vector flat sketches for a full range of garments (shirts, pants, skirts, jackets, dresses, etc.) and corresponding garment details (sleeves, collars, pockets, waistbands etc.). Consistent sketch size & proportions lets you place multiple apparel sketches on a presentation board or portfolio page without resizing to the same scale! Great as a travel sketch library – our Illustrator flat sketch templates can be easily stored on a flash drive or cloud storage for quick access at home, on the job, in the classroom or anywhere. Perfect for freelance designers, fashion students, and any designer on-the-go! All fashion industry standard technical flats in these Fashion Sketch Templates are drawn with true length proportions at approximately 1/8th scale (8x’s smaller than actual size), making it easy to sketch design details and placements based on real dimensions. At 1/8th scale, 1 grid square = 1 inch. For example: to draw a 20″ long skirt, just count 20 grid squares on your screen. (Width proportions are slightly slimmed to meet most fashion drawing aesthetics). Enlarging Illustrator fashion templates to show accurate artwork layouts and detail sketches is also very simple: To draw a neckline embellishment that is 7″ wide, simply scale the artwork 8x’s (800%) to create the actual size artwork for your factories. Combine these flat drawing templates with our other Illustrator fashion templates to effortlessly create detailed flat sketches and stunning CADs & fashion presentation boards! Our Adobe Illustrator fashion flat drawing templates are perfectly compatible with our Illustrator Sweater Brushes and Swatches, Vector Garment Accessories, Illustrator Fashion Brushes, and Fabric Swatches & Fashion Embellishments, which are also drawn at 1/8th scale. All flat drawing sketches are Live Paint friendly, allowing you to fill flats with color & fabrics FAST, and eliminates the need to join paths or create closed shapes! (Free Live Paint tutorial included + watch this quick video demo). If you’re a professional fashion designer, then you already know how important technical flat sketches & CADs are in the apparel industry from design through production. We’ve taken care of the tedious and technical side of fashion technical drawing, so you can spend your time on actually designing! Create a new document – this is where you will “draw” your fashion sketches. Open a Body file (ex. Tops Bodies, Pants Bodies) and select the body sketch of your choice along with any corresponding details you wish to use (ex. sweep, waistband, cuffs). Copy the selected body sketch and Paste it onto the new document. Now open a detail file (ex. Sleeves, Collars, Garment Details) and select the desired apparel detail(s). Copy/Paste the selected detail into the document with your body sketch and place the apparel detail in its’ appropriate position over the body. Continue adding garment details until you’re happy with the design. Now your fashion sketch is complete! While these Illustrator fashion templates make it easier for you to draw fashion design sketches and will save you hours of fashion technical drawing time, it is NOT intended as a substitution for knowing how to use Adobe Illustrator! 1,320+ Mix & Match Adobe Illustrator Flat Fashion Sketch Templates for only $49.95! it happens sometimes. There is a glitch on the payment processing side that we can’t work out on our end. You can make a purchase and we’ll refund you for the duplicate product. You can also contact support team via “contact us” link and ask to create purchase manually. Hi can you please email your request via contact page. The link is on the top right. Thank you. I bought this ebook some time ago and I am very happy for it, but I got a new computer and I want to download the templates but I can’t find the e-mail with the link! I am trying to purchase the template but whenever i add to cart , it automatically adds 2 as quantity, and when i try to change it to 1 , it does not take it. Please suggest what shall i do. i don’t need two of each product just 1. OMG I love it! Best purchase ever! I’m an online fashion seller, I was in need of flat sketches to use as visual aid for inserting measurements. I was wasting so much time designing and creating my own vector flat sketches and this has cut down my time to almost instant.Wish I had found it days ago. Had to come back to your website to thank you and give you a good review! I will be purchasing the men’s package as well soon. I would like to know does the mentioned software comes up with menswear detail and items ?? And also does it compatible or work with Adobe Illustrator CC2018 ?? 2. Our brushes are created to easily change the color to match your projects. There are 2 different types of brushes in this set: Outline Brushes & Fill Brushes. Instructions for recoloring both types of brushes is included at the top of each file. For example, ruffle brushes are fill brushes, which means they already include a fill color which can easily be changed by changing the color of the path stroke (not the fill). This is demonstrated in the instructions at the top of the page, but if you are still having trouble, I am happy to walk you through it in more detail. 3. At this time, Adobe Illustrator does not allow brushes to be created using bitmap images (such as a scanned fabric). You would need to apply the brush stroke to your sketch as needed, then expand the brush and replace the fill with a swatch created from your scanned fabric print. I can also review this with you in further detail if you have trouble. I have purchased the brush set and look forward to using these great tools. However, I am experiencing some problems with one of the brushes which I wanted to use immediately. 1. Had any problem contacting for support? 2. I am using the Ruffle Hem brush and when making a stroke, the ruffle brush fills the ruffle in all black instead of just the outline. The fill is off and the stroke weight has been tried out in all low weights. 3. Would anyone be able to also help in, how to fill a ruffle, from using the ruffle brush with a scanned fabric print? Hi Maddalena, simply click the Add to Cart button at the bottom of the product description, and when you are ready, click “Checkout”. This is the most amazing tool! Accurate and easy to use. Such a lifesaver. Also, if you have questions, the response/help is AMAZING!!! The service is great !! Help me save a lot of time !! Thanks for sharing these styleline, template and detailed illustration. Great work. Thank you so much for creating this template package. It has helped me tremendously. I love how easy it is to mix and match the pieces to create new designs and if I need to change something, it’s very easy to do. This is truly worth every penny and the time I save is priceless. There are step-by-step PDF instructions in the READ ME folder included with this item. If after reading the instructions, you still have questions, please email us: support @ mypracticalskills.com (remove spaces). Does this package include a pre drawn moto / biker jacket?? Really great set. I can see getting a lot of use out of these and the price is a very good value for all you get. All Products are amazing and save tons of time, also the customer service is great. We use your flat sketch templates and they’ve really sped up our technical drawing times – thank you! The people from this Company are really nice and helpful. They helped me recover my purchase when my computer broke! The Fashion Sketch Templates has SAVED MY LIFE! It has everything I need. If I need to change something, it is easy to do so. This has taken HOURS off of my drawing and filling time. Thank you, DesignersNexus!!!!!!! Great product, I was wondering if you do have accessories like all hats/gloves/scarves all types. Hello everyone thought I would give you some feedback on this product. O.K. I bought this and its O.K, not GREAT but O.K. My style is a bit different and that’s a problem. I find it very difficult to make the bodies work with anything that I have done. The pockets, some of the bottom details are useful. But to be honest everything else doesn’t work for me. I have to redraw it quite a bit. But if the company you are working with likes this style that you maybe able to do well with this. I have only used about 15 maybe 20% of this package when working. its really amazing, i was so excited to see the details and designs. gonna use it for my sketches. i think i can complete my task successfully. Hello !! your website is great. I love you all so much.. Your templates, designs helped me a lot.. I never forget your website. This is an exciting moment for finding such a efficient website. your support service was incredibly fast!! Amazing range of garment styles and details all in one place to make designing your own garments much quicker and simpler just by adjusting them as you desire. A fashion designer’s essential! very useful in my work….